Harriett Baldwin was able this week to congratulate Iain Duncan-Smith in person and the Centre for Social Justice for the thought-provoking policy report it published this week. 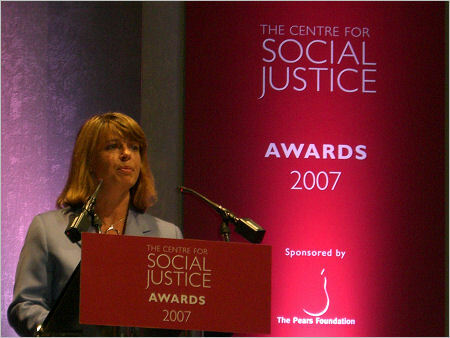 At the 2007 Centre for Social Justice award ceremony yesterday evening, Harriett Baldwin spoke in support of the Centre's work fighting the paths into poverty in Britain. The awards recognised outstanding charities from Bristol to Birmingham, from Newcastle to London, all of which are achieving remarkable results in tackling family breakdown, drug addiction, victims of abuse and other destructive situations. Also speaking at the star-studded awards were Iain Duncan-Smith, founder of the Centre for Social Justice; Sir Menzies Campbell, leader of the Liberal Democrats; John Read, former Home Secretary; Olympic athlete Dame Kelly Holmes; Oscar winner Julian Fellowes; Richard Briers; John Colshaw; June Sarpong and Simon Callow.